If this monitor system looks somewhat familiar, that’s because its first incarnation was launched over two years ago. 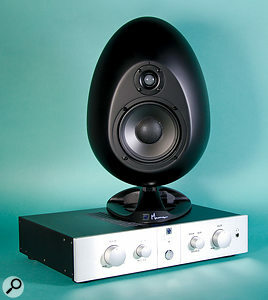 The concept for the Egg speakers was hatched by acoustic designer Andy Munro, James Ishmaev–Young of Sonic Distribution and SE Electronics’ owner Siwei Zou. Andy Munro is well known for his commercial studio designs, and also his previous involvement with Dynaudio loudspeakers. This new model adheres to the original ‘active speakers with external amp pack’ paradigm, but behind the scenes there have been a few significant changes — not least that manufacturing has now been moved from China to the UK, under the Munro Sonic name, with both cosmetic and circuitry upgrades to the power amplifier section to further reduce noise and improve performance. As with the original Eggs, the cabinet is a ported, egg–shaped, 14–litre moulding. The shape provides both mechanical rigidity and a significant reduction in diffraction, as there are no sharp cabinet edges. The curved surfaces also break up internal reflections and suppress standing waves, so despite the technical challenges in manufacturing this type of cabinet, there are many potential benefits. The reflex port is tuned to 51Hz, and the overall frequency response of the speakers is 45Hz to 20kHz at the –3dB points. As before, there are recessed LEDs that are visible only from the sweet spot, making it easy to physically align the speakers, which come with their own adjustable bases. Handling the highs is a one–inch silk–dome tweeter with a neodymium magnet, while the lows and mids are delivered via a 165mm polypropylene–cone woofer. As far as I can tell these drivers are the same as those fitted to the original Eggs — the most noticeable changes are in the amp pack. Putting the amplifiers outside the speakers is a departure from the active–speaker norm for speakers of this size — it’s a configuration most often seen in large–scale studio monitor systems — but there are good reasons for doing it. As well as avoiding potential problems due to mechanical vibration, this approach means the user can put the controls close at hand. However, a separate monitor controller may still be necessary as there are no dim or mono switches on the amp. All the active crossover circuitry (2.1kHz) and the four 50W amplifiers powering the two bi–amplified channels are located in this stylish case, which then connects to the speakers via the included three–metre heavy–duty Speakon speaker cables. Though the amplifiers may seem modestly powered when compared with other active monitors, they pack plenty of punch, with their 35V power rails providing adequate headroom and allowing a maximum SPL, per pair of speakers and at one metre, of 118dB. All the circuitry is traditional analogue, an approach Andy Munro has taken to avoid problems being introduced by digital conversion systems and digital volume controls. It’s also my own experience that many DSP-controlled monitors are inherently noisier than their analogue counterparts. The dual-power-supply design is also linear rather than switching–mode, and protection against overload and short circuits is built in. Extra thermal protection is provided for the tweeter in the form of an automatic cut–out that resets automatically when safe conditions are restored. As before, the control panel is pretty uncluttered, but the seriously chunky metal fascia is noticeably thicker and the knobs have been redesigned. Input switching for swapping between two sources (aux and main) has been retained, where the inputs can be on either balanced XLR or unbalanced RCA phonos — but there’s no jack option, something that could have been redressed by using ‘combi’ input sockets. Separate left- and right-channel LF and HF EQ trim pots are included on the rear panel for matching the speakers to the room (up to 10dB of cut at 63Hz and, for the highs, +1 to –5 dB at 10kHz), plus there’s a large mid–band control on the front panel, originally intended to emulate the mid–range hump of typical hi–fi and NS10–type speakers. This can be switched flat or set to introduce a preset amount of cut or boost at around 2kHz. In this new incarnation, the mid-EQ characteristics have been tweaked slightly to have a wider response, but the purpose is the same and the amount of cut or boost is quite subtle. Both main and aux inputs have large level controls, and there’s a rear–panel slide switch to activate or kill the speaker ‘sweet spot’ alignment LEDs. A power switch with blue LED rings occupies the centre of the panel. Sonically the Eggs come over as easy to listen to, with smooth highs and mids complimented by a solid but not hyped bass end. The first impression may be that the sound lacks a little definition when heard alongside other active monitors, but then you soon realise that’s not the case — the highs are all there, but they just don’t sound aggressive. You can hear the same thing with other top–of–their–game monitors from the likes of ATC, PMC, Neumann, AVI and so on — there’s an initial impression that something is missing, until you realise that what’s actually missing is the unwanted high–frequency distortion and phase smearing that makes some budget monitors sound unduly forward. The Eggs also sound like much bigger monitors than their appearance suggests, with confident lows that don’t suffer from flabby over–tuning. Within their price range the Eggs tick all the right boxes, with great stereo imaging, a good sense of depth perspective, an open–sounding clarity and a solid, tight bass end. They make good mixes sound great but reveal every flaw in imperfect ones, just as an effective monitor should, and though the cost has increased slightly compared with the original Eggs, the amplifier pack improvements and the shift to UK manufacturing more than justify it. Maybe the Eggs can’t guarantee an ‘albumin’ the charts, but they certainly won’t get in your way! In terms of quality these monitors are up against the best in class, which includes models from ATC, AVI, Genelec, Neumann and PMC. Compact yet not at all small-sounding. Excellent sound quality; detailed and three–dimensional without being harsh. The cost is a bit on the high side for home studios. The new Eggs sound very similar to the first generation other than for some subtle improvements to the electronics in the amp pack. Be assured that the shape of the speakers is not just a gimmick. £1999 per pair including VAT.